NBC color commentator Cris Collinsworth, during the broadcast of the Super Bowl last month, told an audience of 103.4 million people that he couldn’t explain the NFL’s catch rule. A league flailing for years at defining what constitutes a catch has reached an impasse and now confronts a dilemma: When those entrusted with the duty of interpreting the game for viewers openly admit their inability to do so, someone has failed. In this case, it’s someones: the NFL’s decision-makers. They need to put forward a definition of a catch that announcers can articulate, fans can understand, referees can evenly enforce and players can tailor their behavior toward. League commissioner Roger Goodell understands the league must correct the issue, saying the matter has left him “concerned.” And, equally important, he appreciates that the league should create a new rule instead of fixing the old one, saying, per NFL.com, “From our standpoint, I would like to start back, instead of adding to the rule, subtracting the rule. Start over again and look at the rule fundamentally from the start.” Reports surfaced a few weeks ago that the NFL competition committee is investigating alternate rules; thus, we should expect to see the league enforcing a different catch rule next season. 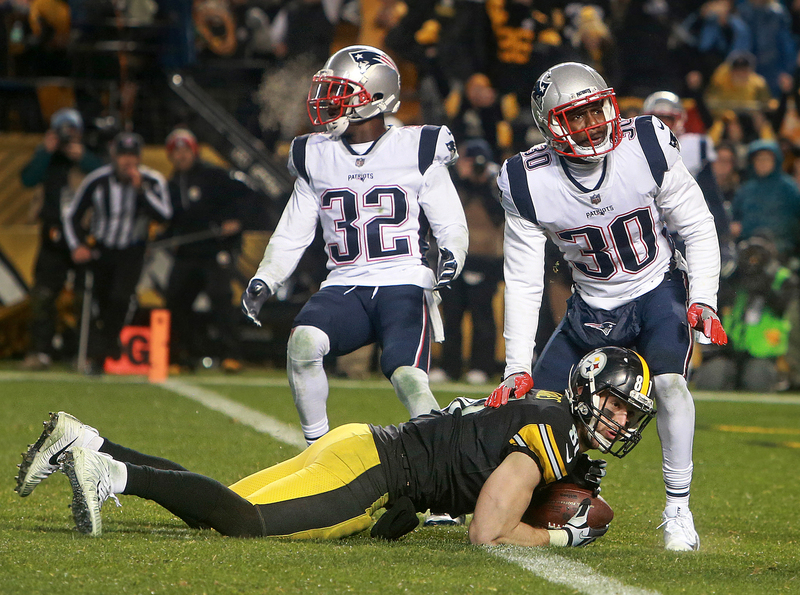 Pittsburgh Steelers tight end Jesse James’ non-catch against the New England Patriots during the 2017 regular season. These plays, nearly everyone agrees, should have been ruled catches, and whatever rule the NFL devises should also come to that conclusion. I think I have the solution, what I’ll call the “2-Feet-Plus Rule”: A catch is completed when a player catches the ball and gets both feet down, plus another action. Here is a list of the other actions that satisfy the “plus” requirement: body part, football move, controlled reach, or catcher sustains possession of the ball when going to the ground. I’m open to adding to this list. A knee or body part equals two feet as always. This is a sequential rule, meaning one must get two feet down (or body part) then the plus must occur. So if a player gets one foot down, then a knee, the sequence starts with the knee and the foot doesn’t satisfy the plus requirement. If the sequence starts with a body part first, neither another body part nor a foot can satisfy the plus requirement (unless the player stands up). The player must maintain possession of the ball or perform a controlled reach. Detroit Lions wide receiver Calvin Johnson (81) is unable to maintain possession of a ball in the end zone while defended by Chicago Bears cornerback Zack Bowman (35) during the second half at Soldier Field. The Chicago Bears defeated the Detroit Lions 19-14. Johnson jumps up for the ball and comes down on both feet, satisfying the two feet portion of the sequence. Then he falls down on his left hip, satisfying the plus portion and completing the catch. That he loses the ball afterward means nothing. The catch and touchdown stand. This is a catch under the 2-Feet-Plus Rule. 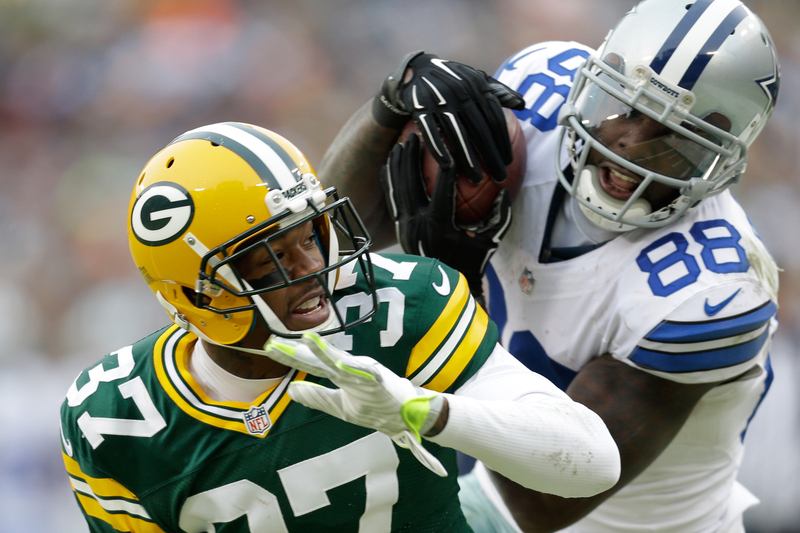 Dez Bryant #88 of the Dallas Cowboys attempts a catch over Sam Shields #37 of the Green Bay Packers during the 2015 NFC Divisional Playoff game at Lambeau Field on January 11, 2015 in Green Bay, Wisconsin. Initially ruled a catch, the call was reversed upon review. Here, Bryant catches the ball then gets two feet down, satisfying the two feet portion. Then, he gets a foot down again, completing the sequence. For good measure, his forearm strikes the turf, then performs a controlled reach. He obviously completes the catch under the 2-Feet-Plus Rule. New England Patriots Devin McCourty (32) and Duron Harmon (30) look for a call after Pittsburgh Steelers tight end Jesse James, left, lunged over the goal line during the fourth quarter of a game against the New England Patriots at Heinz Field in Pittsburgh, Pa., Dec. 17, 2017. After official review, it was ruled an incomplete pass. Here, James gets a knee down, satisfying the two feet portion of the sequence. Then, with the ball fully under control, James performs a controlled reach toward the goal line, satisfying the “plus” portion and thereby completing the catch before the ball comes free. This is a catch under the 2-Feet-Plus Rule. I think the 2-Feet-Plus Rule solves the NFL’s problem. It’s easy to communicate — Collinsworth wouldn’t have stuttered and stammered trying to explain this during the league’s showcase game — and the rule, if enforced, would have resulted in a catch for three of the most obvious blown calls in the past few years. The NFL is commonly called a copycat league. Go ahead, NFL, steal this.